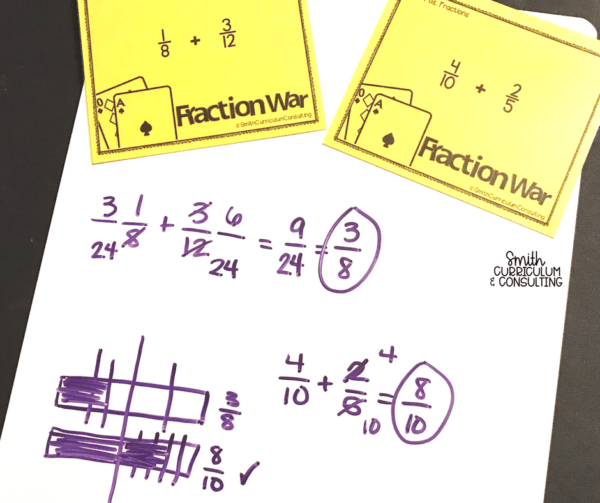 For many people, implementing Math Workshop in Middle School is a foreign concept. I’m here to tell you that it doesn’t have to be. You can make it work. I did and I honestly think that my students learned more because of it. 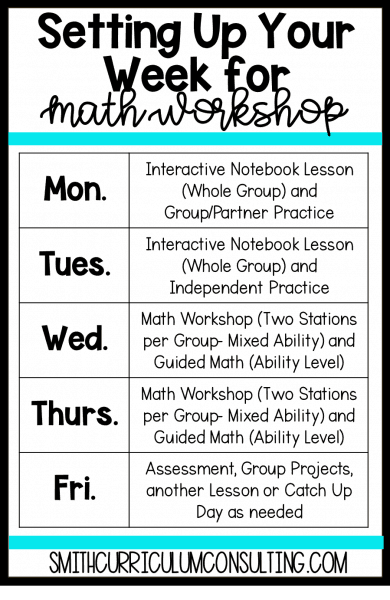 Many of you know that I am a HUGE Interactive Notebook user and being so does not mean it is the only think that I do in my classroom, in fact using Interactive Notebooks works well with implementing Math Workshop. Each week in my class the set-up of our week would be very similar to the prior and following weeks. I did this to save my sanity and also make it easy for my students to understand as well. As you can see during the week there were at least two days where we had direct instruction time. I typically had these days back to back to allow for easy flow of the lessons that we were working on but it can also be done where you split them based on the flow of your units. 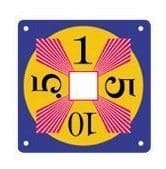 Each of these stations were set up for my groups of students to go to and I always had two set ups of Math Facts and At Your Seat as I had a total of 6 groups rotating. During the twenty minute rotations, I would then pull additional small groups of students to work on skills that they needed help with. As you can see in the sample week my students were practicing skills on fractions. This week of work could be done at any time during the year because we all know students struggle with fractions throughout the year. 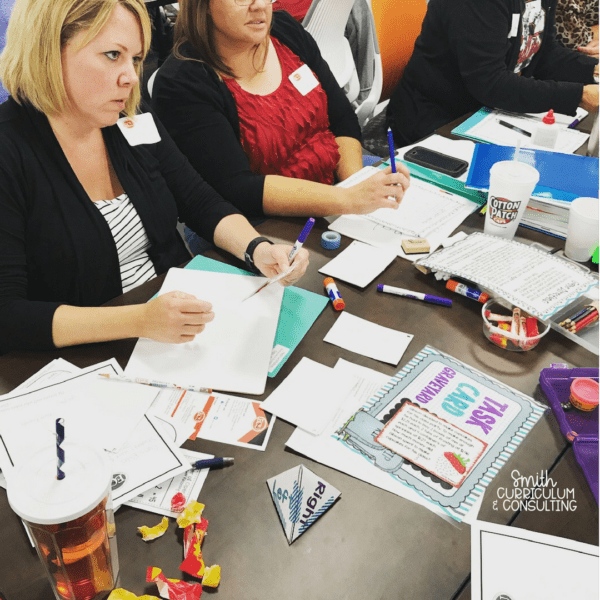 I always scheduled stations that were skills from at least two weeks prior so that my students had not only been instructed on the material but also had resources to use in their interactive notebooks for reference. where students are truly showing me what they know. This sometimes can be partner work where each person has a different colored pencil to do their work so that I can easily determine who did what work on the page (hint: this helps you see if someone took over the assignment or if someone was being lazy). 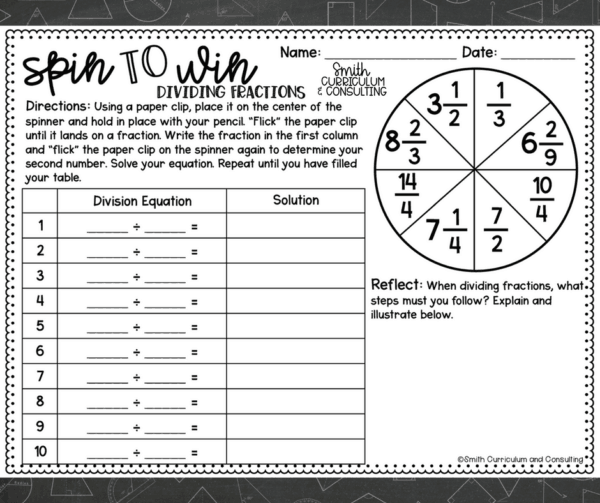 So during this week the students would be working on a Spin to Win for All Operations with Fractions. I also try to keep this station the same each week and just change the concept so that I’m working smarter and not harder. Hence why the Spin to Win packs (or TpT) for each grade level (available in Second through Eighth right now) are a great thing because you can just put a new one in each week. Talk to Me is always a station that I encourage there to be communication between all of the members of the group at. I want them to talk about what they are learning or discuss their answers together. Left, Right, Answer is a game that I created a few years back to be used with ANY set of Task Cards. For this week they would use Problem Solving with the Halflings which reviews Fraction and Decimals in word problems. I will tell you that the fans of Lord of the Rings, Dungeons and Dragons, etc. truly LOVE this set of task cards because it appeals to the nerd side! The final part of MATH Workshop is Hands On Fun. I use this for my students to either do a STEM related activity intertwined with what we are doing or playing a math game of sorts. My students learned to play the game 24 and truly loved it. I ended up having to buy almost ever set! The object of the game is to make 24 and since they are using Fractions and Decimals it gets a little trickier. 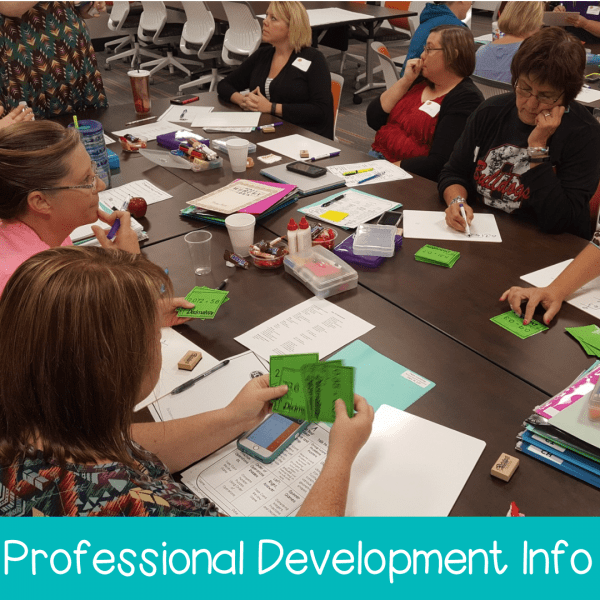 For most teachers pulling small groups is a tricky part and I will admit that it takes time to set up your small groups and know that they can fluctuate on the regular depending on the skill that you are covering in your groups. I chose not to have my small groups as a rotation and rather pull students from their stations (at least 2 from a group, never singling a student out) and do small groups that way. This way my station groups could be somewhat random and only my small groups would be ability level grouped. Each week my small groups would be put together based on the skill being covered and they would be excused from whatever station that they missed due to being in small group and that was okay because the station work was review material. This time would allow me a good 20 minute small lesson with 4-6 students giving them my undivided attention. We would do a small direct instruction, some practice work and many times then do a short game of sorts that they would then see in stations in a few weeks. This helped expose them to material and then they would be able to be an expert for their group when they saw it down the line. During small groups I did a lot of informal observations and always had some pre-printed post its handy so that I could track what we covered and what I saw for each before I wrote them in my data binder. 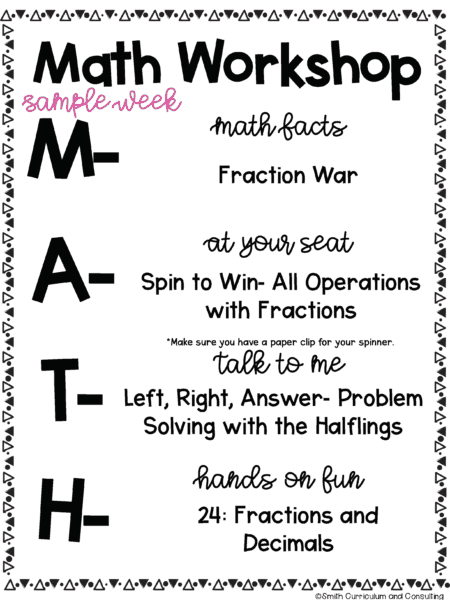 There is so much more to share about Math Workshop and I want to answer your questions. Please feel free to comment below so that I make sure to answer those for you in upcoming posts. 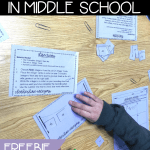 When you are doing small group, how do you manage the kids getting off task? How do you grade this? I’m one of those where I don’t ask them to do anything for “free” cause I get crap back. You have to start with teaching what the roles of are each student during Math Workshop. I will tell you that the first two weeks I don’t pull small groups as I use that time to monitor what is going on in stations and reinforce the positive behaviors. This allows me to make models of those that are doing well and really does help set the standard for what I expect when I am working with small groups. 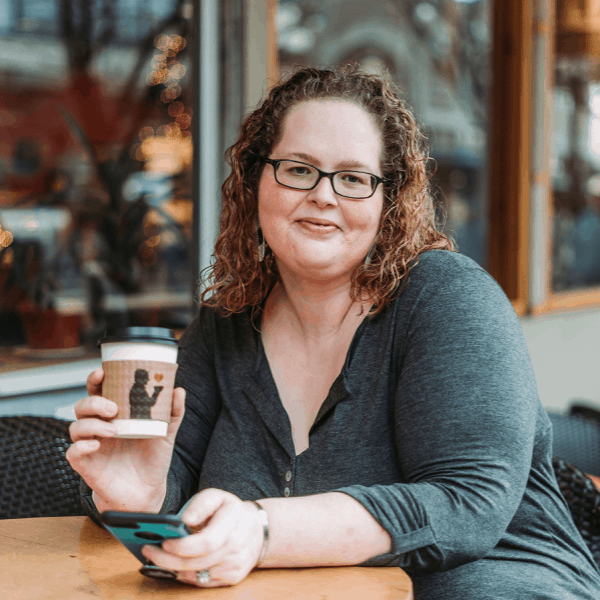 I will be blogging about some of my strategies that I use for this time as well. I have my students turn in all of their work at the end of the second day of stations. I can then grade on completion, mastery of skills, or even overall correctness. I do change it up so that they never know what I am looking for. It is important though to not penalize students who were in small group and may have missed a station due to that. Hope this helps and I plan on blogging about that more as well. What does your pacing look like when you do stations. I’m worried about spending too much time or too little time compared to the other teachers on skills. Also, are you rotations just skill review? What about practicing the concepts that were taught that week? When doing stations they spend roughly 20 minutes in a station activity so as to not get bored and get off task. These stations are skill review to reinforce spiraled skills throughout the year as we know that once they have been tested on something many students toss those skills. This forces them to keep using them. Concepts taught within the week are then practiced further on the final day of the week through group work/quick quiz/ or even a whole class game such as Trashketball. That Friday is our skill practice day and I have them use their notebooks to help enforce the skills. I will say that this method does bring my units a little slower than other teachers but it in the end it pays off as they are getting the review that I would normally be cramming in before the state test all throughout the year. Any chance you have videos of this in action? 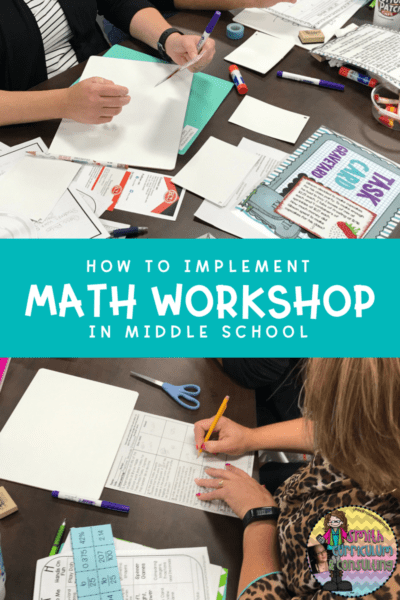 I taught my math in a workshop format this year, but it was tricky and not completely to my standards. I would love to see this and adapt it to my fourth grade classroom! I actually do have a video of my doing a small group and of a student doing a center, but not a full class.